He was crowned "King of the Bushers" and once compared to Walter Johnson. But, young Cliff C. "Tiny" Turner of Mountain Park, Alberta (coal country west of Edmonton near the BC border) had barely started when he was struck down and out. The earliest newspaper notice seems to be in 1920 as the teenager begins to grab attention pitching for Sexsmith in Northern Alberta. The following season the right-hander had an introduction to pro ball in a tryout with the Edmonton Eskimos of the Western Canada League (as far as we can determine he got just an inning of work as a reliever). 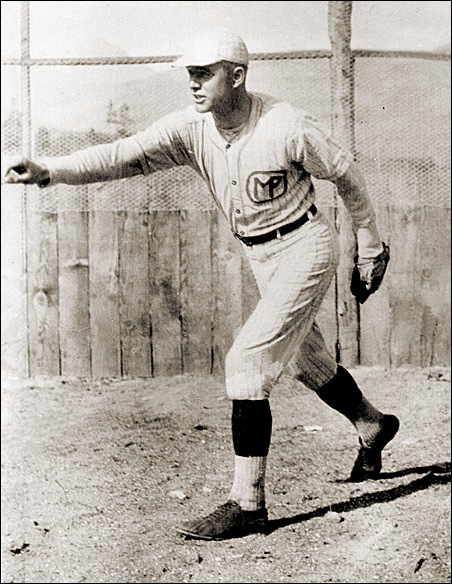 In 1923 he was the ace hurler for the Cadomin-Mountain Park nine and at age 22 was the toast of Alberta in 1924 as he led the Mirror (a railway village of several hundred east of Red Deer) Canadian Nationals to impressive showings in the Central Alberta League and then in upper level competition in Edmonton. Mirror was invited as one of the teams for a "Bushers Tournament" at Edmonton and led Mirror to top money. It is just seventeen years ago this summer that the immortal Walter Johnson of the Washington American League team was burning up the bushes down in Idaho for the little tank town of Weiser. He was striking out from ten to twenty-four men every time he pitched, and shutting teams out right and left at libitum. Every league ball team in the northwest was trying to sign him up, including the Edmonton team of the Western Canada League, but Cliff Blankenship, scouting for Washington, came along, secured his signature to a contract, and carried him back to the capitol of the United States, where he immediately made good. On August 4th, Turner hurled a four-hit shutout in the afternoon (with 16 strikeouts) and then came back in the second game to twirl four shutout innings (six strikeouts) as Mirror came from behind to win 7-4 and take top money in the tournament. A panel of thirty experts selected Turner as the top player in the event, "King of the Bushers". The right-hander had a sensational season. Records are far from complete, but he won at least 13 games, nine by shutout. We've been able to track down 17 starts and two relief stints for a 13-3 (with one tie) record. In one amazing stretch Turner had 60 consecutive scoreless innings, with six straight complete game shutouts. He rang up 88 strikeouts in that 60 inning stretch. In early September of 1924, Turner was signed by Ty Cobb's Detroit Tigers with an invitation to spring training, Farmed out to the East Texas League for his rookie season in pro ball, Turner excelled with 17 wins in over 190 innings of mound duty, But, not feeling well near the end of the campaign, Turner left the team early to return home to Alberta. Near the end of September, his conditioned worsened and he was taken to hospital in Edmonton. He died the next day, diagnosed with typhoid fever. He was just 23.